DUNE - Special Edition: NEW! IMPROVED! 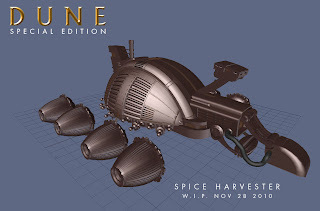 Spice Harvester W.I.P. NEW! IMPROVED! Spice Harvester W.I.P. Happy Thanksgiving to all who celebrate it! I've finally had a small amount of time to get back to working on this project and recently came across a whole slew of reference images I had not previously seen on the 2-disc DUNE DVD (Thanks to Joe Lawson for letting Me borrow that). Worked out a new way to model all the curved parts that allowed Me to UV map them before I curved them and I think the results are looking considerably better than before. felicidades por tu blog desde Barcelona. Soy un gran admirador del film de Lynch desde que lo vi en 1984 cuando era un niño. Mi blog (elgusanodearena.blogspot.com), está en parte dedicado a el, y al cine fantastico, de terror y ciencia-ficcion en general. Hey, you might like this design I found online !! A comment about the artwork you mentioned you found though: You are aware that H.R. 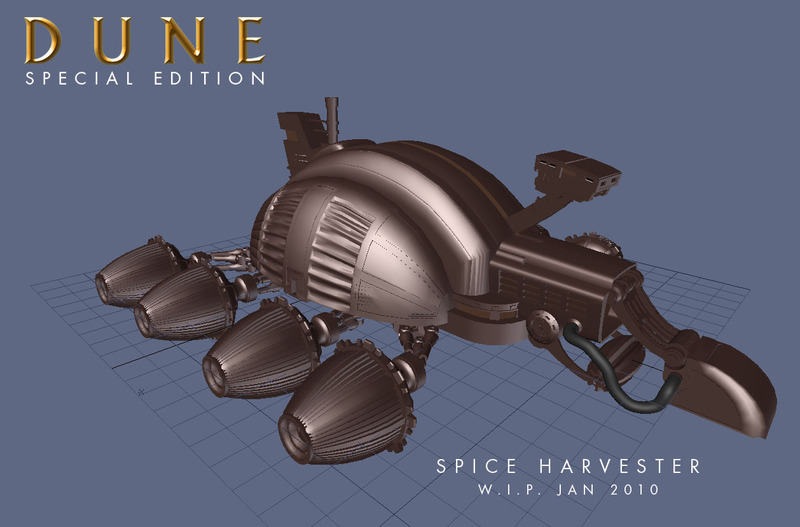 Giger was originally hired to design dune, and produced a bunch of stuff, the harvester among other things. A search on your site revealed nothing of the sort..
Giger was hired to create stuff for the Jodorowsky version of Dune which never came to fruition, although Panasonic did film a commercial using Giger's design for the Harkonnen castle which can be found on youtube. I should have checked your latest posts - I've just posted a comment on your old Spice Harvester entry with a couple of links to sites showing photos of the chassis of the vehicle, where and how the wheels connect, but it looks like you must have seen them already judging by your latest 3D image! D'oh!